It is expected, by the end of SUMALOM project, to carry out the PWLUP process in the 6 Kum Ban (Village Clusters) located in the NTPA. From the 6 Kum Ban, 1 is located in Hin Heub district (Naxam) and the 5 others are part of Sang Thong District. It represents a total of 43 villages. On this total of 43 villages, 27 PWLUP were already completed up to now, at least up to step 6. Three Kum Ban have been completed : Naxam, Nalat and Xo. The map below illustrated the areas the completion status up to now. On the 6 Kum Ban located in the NPA, 3 have been totally covered by the PWLUP : Naxam, Nalat and Xo. 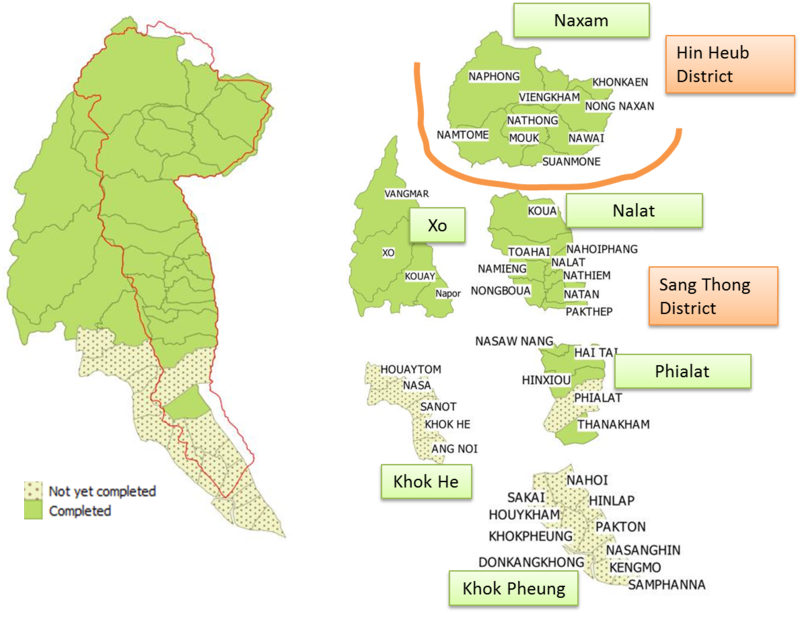 Xo Kum Ban is not located in Nam Ton watershed, but is part of NTPA. One of the major issues in Nam Ton Watershed (and to a large extent in Lao PDR) is the unclear land use zoning which generates lack of long term perspective for farmers and villagers. Land use zoning and management widely impact natural resources, water being likely the key one. For that reason, it has been decided to extent the existing Participatory Land Use Planning (PLUP) process by merging Water with Land Use in a new so-called “Participatory Water and Land Use Planning” (PWLUP). Implementing the PLWUP process in Nam Ton Watershed offered a great opportunity to identify the main key issues in watershed by including Water resources management together with the debate on Land Use. More specifically, as far as water is concerned, the PLWUP exercise, carried out together with the villagers, allows identifying, mapping and formalising specific areas or zones to be protected in term of quality and quantity such as wetland and zone where flood can be buffered, aquifers protection areas, river embankment protected zones, fish reproduction zones, new paddy areas etc. Identification of water outtakes, water needs and water related issue from the perspective of grass-roots communities. Identification of Villages to consider when developing water conservation activities as a part of Village Development Plan Process which is one of the key component of the whole watershed management planning process. Develop the concepts of water monitoring, water use and water allocation. Data collection related to water resources and water issues will are conducted amongst district, Kum Ban (village cluster), villages’ level. The conclusion of the key issues in Watershed Profile by grouping those related information. Villages are supported to consider water conservation activities and their village development plans. Defined Village Water Volunteers and Village Land Volunteers to allow them work together with the already planned. Water conservation monitoring activities, training and awareness amongst their villages and Kum Ban are conducted by Village Water Volunteers. Enhance evaluation and re-iteration the village water conservation activities by villages. Establish grass-root platform for preparation and participation to watershed committee meeting.